While the CI algorithm provides a meaningful and elegant solution for the problem of fusion under unknown correlations, the fusion of attitude states is not trivial. The main difficulty with fusing attitude estimates is the choice of attitude parametrization. The traditional attitude parametrization of choice for space applications, the quaternion, must satisfy a unit norm constraint. 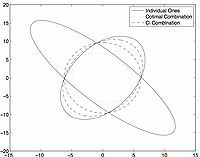 This leads the CI fused estimate to be the solution of a constrained optimization problem. For state vectors including only a single quaternion there are several solutions to the resulting optimization problem. For fusion of state vectors containing more than a single quaternion iterative solution methods are required which also seek to mitigate the increasing numeric instability of the problem statement. Nebelecky, C. K., Crassidis, J. L., Fosbury, A. M., and Cheng, Y., “Efficient Covariance Intersection of Attitude Estimation Using a Local-Error Representation”, Journal of Guidance, Control, and Dynamics Vol. 35, No. 2, Mar.-Apr. 2012, pp 692 –696.